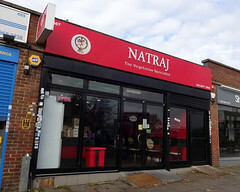 Indian vegetarian cafe and sweet shop a few doors down from Rayners Lane Station. It has another branch in South Harrow. It's small and casual, seating just 14 people at dark marble-effect tables. Walls and ceiling are painted in contrasting white and dark red. A glass counter runs along one wall, with sweets and savouries on display, while packaged items such as mathri, sev, and jars of lime pickle line the shelves behind. Another counter holds pre-prepared curries. Orders are taken and paid for at the till, and they'll let you know when to come up and collect them. Plates, cutlery, and cups are all disposable, and a sign requests customers to put their own rubbish in the bin once finished. Plastic jugs of tap water sit on the tables. Kake visited on a Thursday morning in November 2017. There was just one other customer when I arrived around 11:15am, but three more turned up shortly afterwards. They all seemed to know each other. No music was playing, just the hum of the fridge. Bhel puri (£2.50) photo was a generous portion, but unfortunately a little dull. There was very little zing, and the puffed rice was slightly stale. The chopped herbs on top were primarily stem. However, the potato pieces were competently cooked, and there was a decent hit of chilli heat. Masala tea (£1) was OK, though the spicing was rather indistinct. It came unsweetened, with sugar offered in packets at the counter. Accessibility: A short but steep ramp to get in. Toilet not checked. Last visited by Kake, November 2017. Opening hours taken from menu, November 2017. Last edited 2019-02-03 15:29:42 (version 2; diff). List all versions. Page last edited 2019-02-03 15:29:42 (version 2).